Auckland Transport (AT) is seeking feedback from locals on how to improve reliability and efficiency of travel along Lake Road, between Devonport and Takapuna. After years of voicing concerns about the state of traffic on Lake Road, mainly during peak times on weekdays but also on the weekend, AT are reaching out to the community to understand what our preferences are. They are hoping to elicit thoughts and suggestions on a possible solution to the unpredictability of traffic conditions and identify the best way to improve the reliability and accessibility of travel choices to and from the peninsula. What is Auckland Transport proposing? AT has found that many vehicle trips down Lake Road are short and local. Their view is that these local trips shouldn’t be made by car, but by ‘walking, cycling or taking the bus’, which would free up Lake Road. Their approach is to bring in a mix of new transit lanes that would be dedicated to public transport and higher occupancy vehicles, plus expanded walking & cycling facilities and ‘technology solutions’. They are also proposing that the Esmonde Road bus lane be converted into a new transit lane for public transport and higher occupancy vehicles. The council are saying that this will be supplemented by better ferry and bus services. Technology would be introduced to give travellers more up-to-the-minute traffic information before starting their journey, via smartphone apps and electronic road signs. They are also thinking about getting rid of all Lake Road street parking. AT have come up with three alternative plans, each with differing levels of investment and importantly, very different timelines. – More ‘walking and cycling facilities’. – Greater use of technology, i.e. smartphone apps showing traffic conditions & rideshare opportunities plus electronic roadside signs with traffic info. which as we understand would be implemented in the relative short term (within 5 years). What do we get (in addition to the common elements)? When is the public consultation period? AT’s consultation period will be open from Saturday 10 June, running until Saturday 8 July. AT will also be at Takapuna Market 18 June from 8am to 12pm. Are you concerned that AT are seriously considering spending as little as $10m on Lake Road improvements – the cost of 3 or 4 local homes, or perhaps a better comparison, less than 1 per cent of the cost of the Waterview tunnel? download the Lake Road Indicative Business Case here and give your feedback (up till Saturday, 8th July 2017) to AT here. The Devonport Museum in Cambria Reserve had a grand re-opening on Sunday 30th April after a whirlwind refresh that began just one week earlier. In partnership with television series Heritage Rescue, museum volunteers and dedicated locals have been working hard (some even sleeping there overnight) to revitalise and expand the displays in the museum. The Heritage Rescue film crew with host Brigid Gallagher (formally presenter of BBC’s Time Team) has been interviewing local community members to gather stories. Heritage Rescue is a New Zealand-made television series about supporting community museums. They bring in museum and heritage professionals to give expert advice and revitalise displays. Over 100 locals attended the re-opening and speakers included North Shore MP Maggie Barry, the Minister for Arts, Culture and Heritage. Immediately apparent upon walking into the museum was the absence of clutter that some might say used to be a central feature. New displays, better organisation of exhibits, a fresh paint-job and audio-visual additions make the Devonport Museum a must-see for all local residents and visitors. Local Auckland Councillor Chris Darby recently had a constructive meeting with Fullers’ CEO Douglas Hudson and COO Gavin Old. Fullers are adding new sailings to the Devonport ferry service starting Monday 1st May and improved bike storage is being fitted to both the Kea and the Capricornian. The existing bike storage on the Capricornian was inherited and Fullers now realise it does not work. 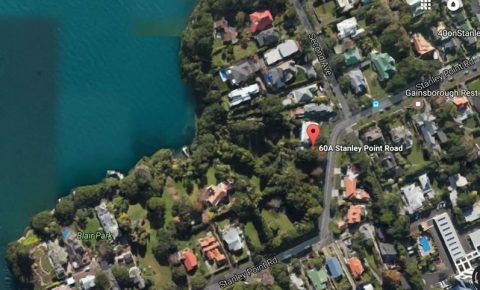 Fullers has advised AT that the Stanley Bay service does not work for them commercially and recommended it be added to the open tender process. What that means is the Stanley Bay service will be open to other operators to tender for along with all other inner harbour services, other than Devonport which is contract exempt. That process is now in the tender evaluation stage and AT should be in a position to announce results in about July this year for implementation in July 2018. The lead-in time is required for operators to procure vessels. Said Chris, “It’s been a rocky ride with Fullers for a fair while but thanks are due for their responsiveness on these matters”. From 1st May 2017, there’ll be additional weekday sailings added to the Devonport timetable. 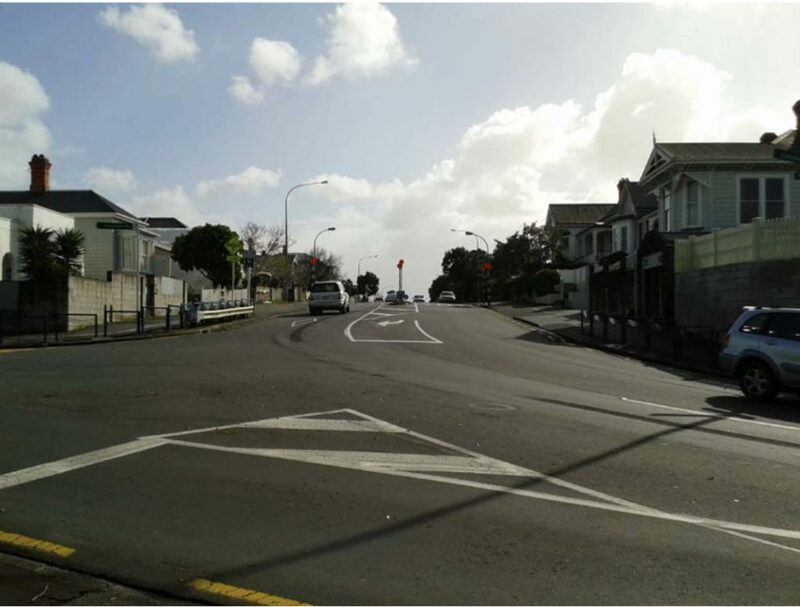 Auckland Transport have announced plans for new cycle lanes to be introduced at the intersection of Victoria Road and Calliope Road in Devonport. The crossroads have been the site of eight serious accidents over the past five years including one involving a cyclist. A presentation prepared by Auckland Transport states that one of its aims is to enable the local community to walk and cycle safely to and from the Devonport Town Centre and Ferry Terminal. It says that facilities currently in place does not adequately fulfil this community need. The specific problems include no on-road cycle lane, off-road cycle path has obstacles including a tree pit and poles; plus it is a confusing intersection layout. AT also believe that traffic is not slowing down for pedestrians on the Victoria Road crossing. Update: 27 April 2017. AT have released another revised plan you can download here. Have your say about it on the council website here. 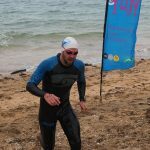 With the weather forecast looking a little scary a week out, the organisers of The 2017 Cheltenham Swim – the Devonport Swim Club – were not expecting a huge number of sign-ups. The annual 2km swim event starts at Narrow Neck beach and finishes at Balmain Reserve, Cheltenham Beach. 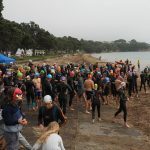 However the peninsula’s local swimmers were not at all perturbed with fickle forecasts and turned up in droves on the day (Sunday 2nd April) with wetsuits, goggles and smiles. 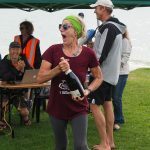 Some of the 144 entrants included hardy ‘Buckets Club’ members who swim weekly off Narrow Neck all year round through winter, storms and gales. This was their Sunday Stroll. Although the sun didn’t feature much on the day, there was only a gentle north-easterly breeze – nice for supporters on a very humid day – and the rain patiently held off. A pleasant surprise awaited swimmers rounding the first buoy as they turned south towards North Head: the incoming tide was unusually strong and whipped them around to Cheltenham in record time. The overall winner was Devonport Swim Club coach Ben Marshall in a whisker over 20 minutes (20:09). First female across the line was another DSC member Dawn Dooley in 23:12. In the under 15’s, the first junior girl home was Isabella Webb in 29:32; and Jake Scott took the junior male’s no.1 spot in 23:09. The donation of excellent prizes from local businesses (including Hammer Hardware, New World Supermarket Devonport, Devon on the Wharf, Corellis Cafe, Chateaubriant, Glengarry Wines, The Vic, Dixie Browns restaurant, JustWorkout Gym, The Natural Health Co and Baked Devonport) made the prize-giving almost as much fun as the race. A stunning hidden bay in Stanley Point, Devonport is now officially accessible to the public. 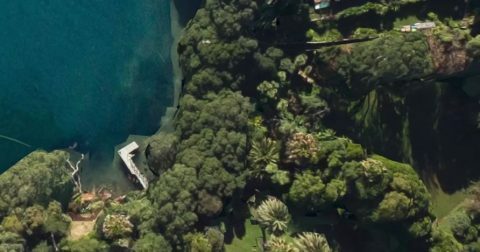 Access to the largely unknown Secret Cove has up till now been practically restricted to owners of the surrounding land at 60a Stanley Point Road. The accessway to the cove was originally bought by 16 now-deceased people in the 1940s, with the aim of protecting access to the beach for the public. Those people never sold the land, but several years ago an immediate neighbour lodged a caveat on the title. Chris Darby, the North Shore Councillor, says that the purchase of the property is a fantastic result for Aucklanders. “The purchase of this land to enable public access to Secret Cove has been a long and complicated one, but it’s finally done now and I couldn’t be happier,” he says. The frequently-heard demands from my father during my childhood will likely resonate with you as you recall your own dinner table dialogues from former years. Recently however, I’m struck by the irony that our roles have been reversed. I may now be an experienced Pilates instructor; with an inherent belief that good sound posture is something everyone should aspire to, but it seems strange he has neglected his own advice. 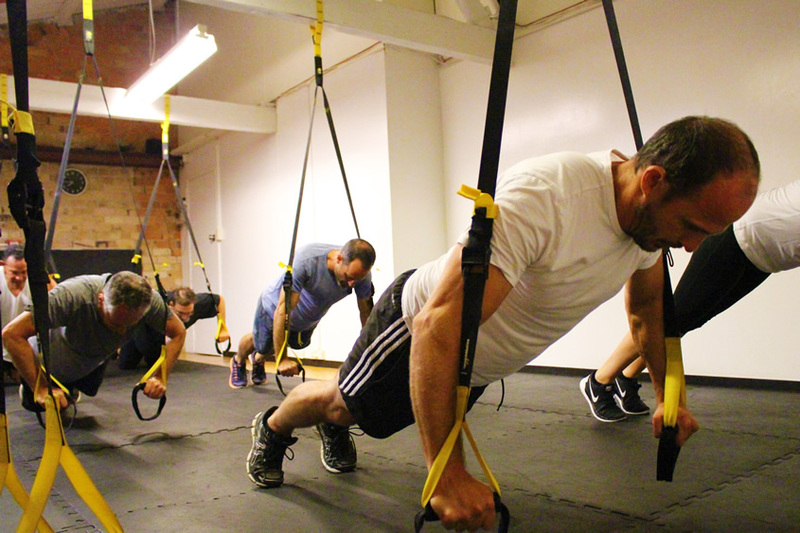 When did Dad stop caring for his body and his physical fitness? Is his situation indicative of male attitudes towards physical health as they reach a certain age? The answer possibly lies in the comparative mortality statistics of men and women. These trends are mirrored throughout the world with the average of 5.3 years separating the death rate between genders. Whilst it would be trivial to suggest that opposing gender attitudes toward health and fitness in later years are solely responsible for this alarming imbalance, it would be fair to consider it as a plausible contributing factor. Statistics New Zealand claims one causative effect to us ladies outliving our male counterparts is that we are more focused on preventative health. Women visit their doctor 33% more than men do on average and 28% of men in NZ do not have a regular GP. This of course leads to cases of men neglecting minor health problems for too long which complicates treatment and provides fewer options for recovery down the track. Whether the reasons behind women taking a more active pursuit of health and fitness goals stem from specific training aspirations, social outreach, vanity or pure boredom, it undeniably results in the preservation of health into later years. Yet with even clear statistics to illustrate this and the abundant information and support offered to men nationwide, mortality rates remain in women’s favour and men still refuse to prioritize their wellbeing. Could fear also play a part in this? The group element of fitness training can often deter males from attending due to their fear of appearing weak in front of others, fear of failing, or their perception that men should be strong and therefore don’t need to address that nagging knee, protruding beer belly or hunched posture. Pilates has often (and to my immense frustration) been perceived as a ‘feminine’ activity; yet ironically its main benefits – Improved posture, increased core strength, injury prevention, stability and flexibility – are outcomes that would significantly, and positively, impact male health in later years. In ten years of working in the fitness industry and holistic health I have witnessed this trend first hand. 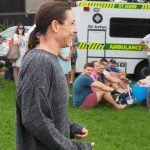 Upon recently moving to Devonport, I knew in my heart I wanted to directly influence and encourage my surrounding community to embrace exercise and healthy holistic living. 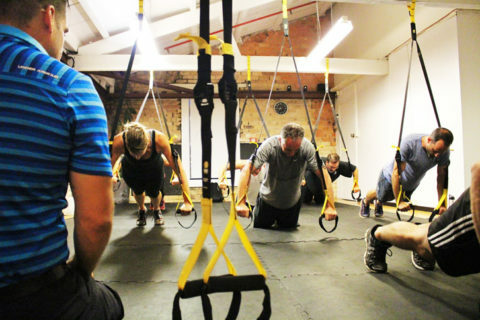 Through joining local family-owned studio SoulSprite, whose mission statement is ‘we have a romantic and achievable notion of making every ‘body’ feel spritely’, I knew I had found a shared philosophy with owners Ben and Kate. With their fast-growing 300+ members, they focus on creating healthier family units and this of course includes the sometimes reluctant, frequently overworked and always time-poor males. 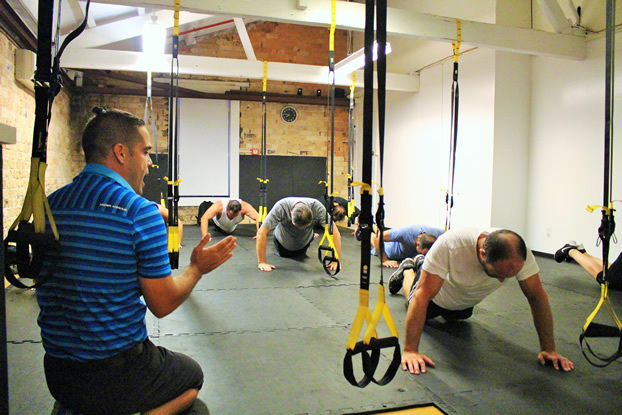 So my personal mission, which contributes to SoulSprite’s wider ambition, is to to break down the preconceived idea that group fitness for men is something to be feared. Indeed, the opposite is true – SoulSprite’s inclusive classes provide both males and females the opportunity to improve their physical health in a relaxed, uncompetitive and social environment. 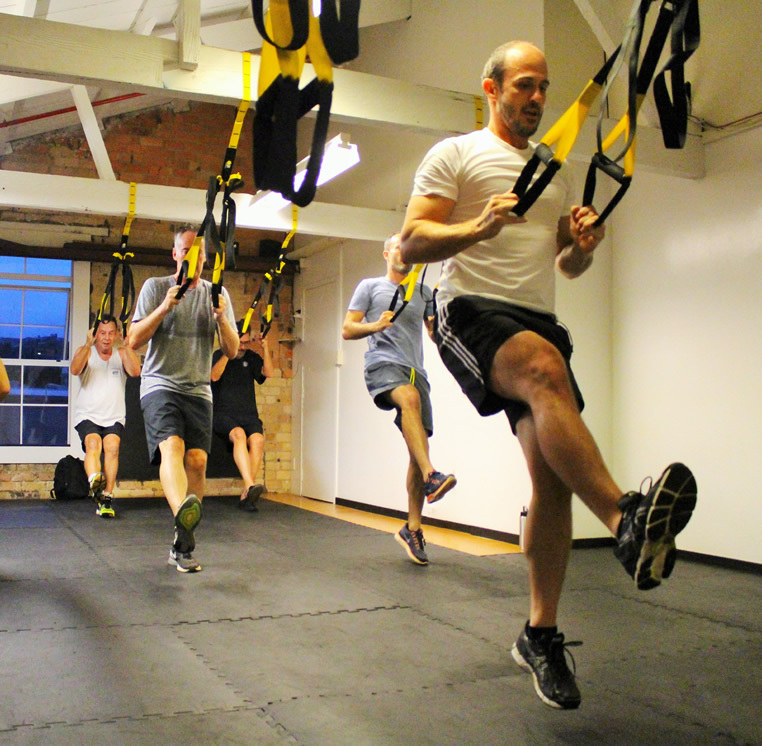 SoulSprite offers small group classes in TRX, Boxing, Pilates and Dance. Plus we have an amazing new kitchen where we have begun to hold cooking and nutritional lessons. To book your free trial class, log on to www.soulsprite.co.nz and experience how your body and mind can feel ‘spritely’ too.